John, research consultant for JVI, an anti-human trafficking organization, shares his heart and his thoughts on human trafficking in India. John gets all the bad news. In fact, he searches for bad news hoping to turn it into good news. Thanksgiving pours from his heart and his lips. A man of relationships, long conversations and heartfelt prayer. He is behind every JVI staff member as they face touchy situations and constant darkness, and as they rescue people from slavery. John is "behind the scenes" and yet spends every day on the "front lines", collecting and sending out prayer requests for the organization. His is an unusual task and one that demands gentleness, sobriety and trust. Speaking with a staff member at the JVI office. 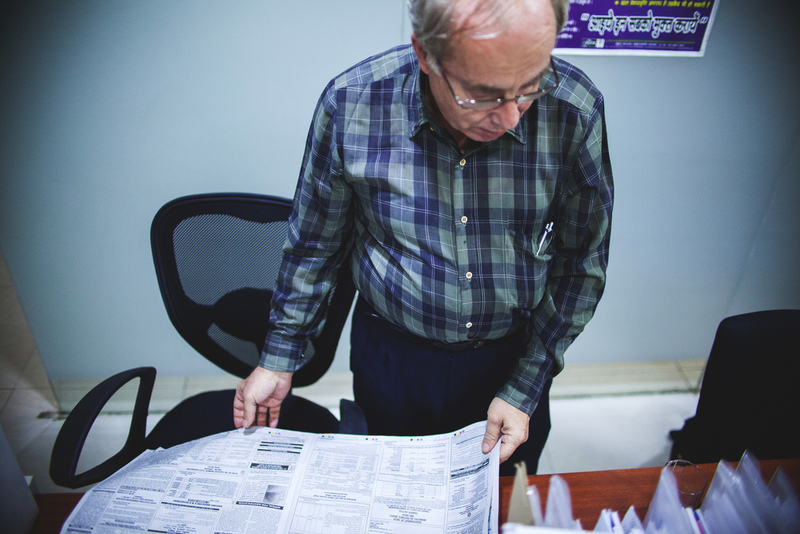 John's primary job is to collect information and prayer requests from his coworkers. However, he has also been able to participate in one or two rescues with JVI, including a rescue of 50 or more children from child labor. "It was neat to be there, to see what happens. The children come with glum looks on their faces, they are unsure of what is happening to them when they are being rescued. They were assured that we were there to take care of them. However, some didn't want to be taken care of. Many of these kids dropped out of school to work. Yet children under 14 years of age will never be able to have an education when they are working." John pores over every newspaper for any news on new human trafficking issues. He also writes up items for the resources page of JVI's intranet site and helps broaden JVI's scope through his bi-weekly news report. "I went under cover once with a few others to a high end brothel. We sat on this one fancy couch in a big empty room and one by one a woman was presented to us under a kind of spot light. The last woman showed to us was still just a little girl. It was so surreal." John speaks at a PUSH (People United to Stop Human-trafficking) meeting in a nearby church. A PUSH meeting involves one staff member from each surrounding NGO that meets to pray over specific needs that each NGO has and share important updates. John with his prayer requests from JVI in hand at the PUSH meeting. John at his desk about to wrap up a work day. "What comes to my mind is this poem inspired by the painting, Landscape with the Fall of Icarus. 'a farmer was ploughing his field… a splash, quite unnoticed - this was Icarus drowning' Here is a city going about it's normal routine and completely unaware of a crisis in the water, a person drowning. This to me is a picture of human trafficking in this Big City. People going about their lives, unaware of the massive issue among them." Pictures from this story can be downloaded from Flickr by clicking on them.